The Master has programmed the Nirahara experience on the simultaneous practice of the sacred Three : Unclutching (Sahaja Samadhi), Feeling Connection (Mahabhava) & En-chanting (Ajapa Japa). Listening constantly to yourself is Ajapa Japa. Being in completion with yourself is Unclutching. Being in integrity with the Master is Feeling Connection. Along with the Prana Samyama, a Nirahari practices living on the 4 Truths ‘Tattvas’ of AIRE – Authenticity, Integrity, Responsibility, and Enriching you and others. Together, these practices unify into the life-blood, the very air of a Nirahari, making them experience the space of COMPLETION, which is LIFE. During this beautiful evolution, they become exposed to many of the inauthenticities, weaknesses, powerlessness patterns they carry about them and others which are directly connected to the food-patterns. 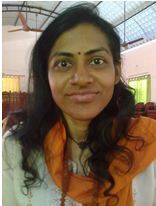 These spiritual practices not only rescue them as knowledge weapons handed to them by the Master, but also empower them with immense spiritual strength to live the Nirhara path with stability and responsibility – to weed out their negatives, smoke out their food patterns and act as washing agents to purify them. What more, the Master has revealed these ancient spiritual practices in a way, totally practicable, and doable for the modern day man. You do not need a separate time for these, they become the very quality of your life. That is why, even though we are all breathing, we are not fully living to the peak of our energy. Unless the ‘Prana, the life-force energy’ is absorbed into us fully, we are in disease. Paramahamsa Nithyananda reveals a deeper mystical meaning of Prana, “Let me give you the deepest meaning of this word Praana and Apaana. Constantly in you, for a moment you remember you exist and after few moments you forget you exist and your mind starts wandering here and there. Try, try this process, try to just sit and remember about you, just – I exist; I remember me; I exist; I remember me; just a self-remembrance! Try, try the self-remembrance. In few seconds you will forget. Please understand, the moments you remember yourself is Praana. The moments you forget you exist is Apaana. Unless you forget you exist, you can’t remember you exist. Unless you remember you exist, you won’t forget you exist. The Praana and Apaana live together. Learn the Truth of Prana. These are essential understandings for all who want to do Nirahara Program. The empowering technique to increase our self-remembrance is a threefold practice: Ajapa Japa, the soundless chanting of the Guru Mantra (Om Hreem Nithyanandaya Namah); Mahabhava (maintaining an overflowing feeling connection to the divine); and Sahaja Samadhi (the technique and space of Unclutching). Niraharis practice all 3 simultaneously irrespective of the work they do whole day as an effortless continuous happening. 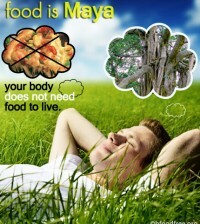 You can assume it becomes a part of us – the part of us that keeps us alive without food. We can say the Prana Samyama is working when all these 3 processes work on us, rather than we working on them, it is an effortless practice – not a ritual that we force it on ourselves, but done in an exciting spirit. The Master says that when ‘spirit’ is added to any ‘ritual’ is becomes ‘spiritual’. Many times small actions you do does not bring big benefits. So you don’t trust the small actions can bring big benefits. But rarely small actions do bring big benefits. This action – the action of being Prana centered, even if it is small, when practiced a little – brings huge benefits. It will make you so alive and productive. If you take 4 days of vacation and are not being productive constantly, you are equivalent to dead. When you can’t help yourself, neither God nor Guru can help you. You wanting to help yourself is a first major criteria for your growth otherwise 4 days is enough for anyone to fall into the pattern of laziness, beyond anyone’s help. 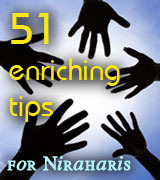 Niraharis constantly access and get fed by the Prana through this self-remembrance practices. 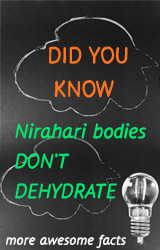 That us why, Niraharis are much more healthier than people who live on food, because they breathe the pure Prana. For all beginners to Nirahara, the Master instructs to go on doing the Prana Samyama whenever you are in ‘self-remembrance – Prana’. Do not give-up on you, if you forget it, which is Apana. Have patience. It will simply start happening just like your breathing, even in your sleep. We are not supposed to hate, ‘Apana’ – your forgetfulness, you are constantly worrying, and creating guilt in you. Stop that. Stop suffering, stop creating guilt for the moment of your forgetfulness. Celebrate your self-remembrance, the Prana. We are given the needed spiritual aids like the prayer wheel, spiritual beads, and more to enrich our practices. Understand, these practises are directly initiated by the Master, and so are already enriched with the power to automatically work on us. All we need is a an authentic commitment, a declaration to simply do it, and live it. That’s all. Unclutching is the Master’s signature technique. We have seen an unexplainable difference in us practicing this technique on our own and doing so AFTER the Master’s Initiation in life altering programs like Inner Awakening. 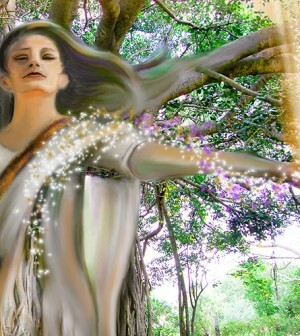 The practice of Unclutching is the heartbeat of His wisdom and forms the foundation for our inner transformation. Once we implement the unclutching process, we can avoid repeating our past experiences and projecting our past into our future. Most of us are prisoners of our past: we repeat the behaviors we are familiar with. This results in the feeling that life is repetitive and boring, that we never experience anything new. When we unclutch, each moment becomes fresh, exciting and filled with new possibility. Unclutching makes all our negative self-fulfilling prophecies, all our past conditionings, all impossibilities into I’M POSSIBLE. The Master declares, “Being in completion with yourself is Unclutching”. Do watch the Science of Unclutching here, your essential video guide. “Constantly listening to yourself is Ajapa Japa”. “Apaja japa of your very being without any word or mantra is Unclutching.” The Master has programmed THE Samyama Initiations to work in us with the power of the Guru Mantra. 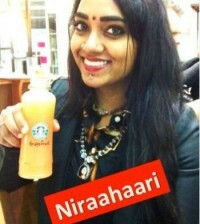 Niraharis are powered by the Guru Mantra. We assure you, the nonchanting chant will become a part of you. Just vizualize the chant going around your throat in any direction. When you keep this up, its like signal to the Master who transcends time, space, distance and is none other than the Cosmic Mother- he will keep you fed and nourished at all times. You will see the energy simply floods to your stomach region, and all over the body, and being. 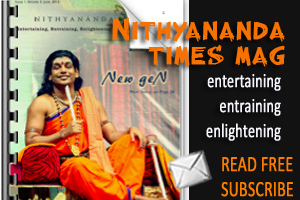 This is the direct experience of the Niraharis gifted by the Master. “The place where the air is getting converted into sound means ‘vaak’, in that place if you put Rudraksha, which is energized, constantly every word coming out will have the coat of that mantra. It becomes like the Ajapajapa. Rudraksha should be exactly on the Vishuddhi area (the throat center). And when you chant the Guru mantra – Om Hreem Nithyanandaya Namaha, you should chant it by visualizing it is rotating around the throat where the air is becoming words. Not in the linear vertical way, the mantra should be in a circulating rotating way. See normally you utter in linear way this is Japa. Ajapa means the sound and mantra should be moving in circular way. You will, when you visualize that your mouth is locked and the mild vibration of that mantra you will feel immediately. Actually when this mild vibration happens, you will see this rudraksha and the mild vibration meeting, the kundalini in you will be awakened. Constantly keep the Kundalini in high energy. And moreover, all the upper chakras and the Ananda Gandha should be activated. This Jeevan Mukti mala takes care of activating Vishuddhi (the throat energy center), Mala (spiritual beads) activates Ananda Gandha and ‘kumkum’ (the processed turmeric on forehead) activates Ajna, the third eye center. That is why in the Tibetan tradition they have the prayer wheel, the mantra when they chant – om mani padmehan – they have a wheel to visualize the circular movement of the wheel. That is why even the japa mala is circular. 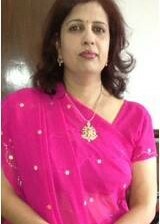 So the mantra should be circulating in the throat that is why it is called Ajapa Japa. 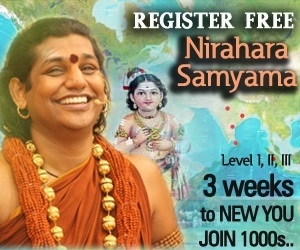 Paramahamsa Nithyananda gives the Ajapa Japa practice to constantly keep the Kundalini high. The Guru Mantra is programmed by the Incarnation to awaken this potential energy for the initiated Niraharis. What is Kundalini, really? Let us learn directly from the source. ‘The eternal flavor of enlightenment. Eternal Gandha (fragrance) of enlightenment. That is what I call Ananda Gandha.” Ananda Gandha is literally translated as ‘fragrance of Eternal Bliss’. Ananda Gandha can only be awakened by an Incarnation through direct initiation. During the Inner Awakening program, the Master initiates all into Ananda Gandha. 1. In the initial level, begin with the the Tibetan prayer wheel. If you want to train your tongue, train your vaak, you can have a prayer wheel. Maybe half or one hour have that prayer wheel and chant the mantra inside visualizing circular motion, then you will see the tongue will not move and the throat will vibrate. The linear way of chanting will be only an entertainment. You can rotate it, clock-wise or anti-clockwise direction, in any hand. 2. Visualize that the Guru Mantra of “OM HREEM NITHYANANDAYA NAMAH” is rotating in your throat like it does in the prayer wheel. Please practice only this mantra. Each mantra is energized with a specific energy. So, this Guru Mantra is for Niraharis and for all who are initiated into Kundalini Awakening by the Master of Kundalini Himself. 3. Wear the ‘Jeevan Mukti’ Mala, which is an energized mala of a Rudraksha bead directly touching your throat region, activating that energy center. This is a powerful life line system for a Nirahari to connect with the Master’s energy directly, 24/7. The Master says, “Please understand always have God and Guru both in your life for feeling connection. You may ask why – Is Guru not enough? Is God not enough? Please understand however strong you may be, at sometimes you will not be able to have complete trust on the Master. Your feeling connection towards the Guru may get shaken a bit. At those time, those moments you need God to hang on to. You need God to keep your spiritual practice and spiritual life alive. You may ask why God is not enough, why Guru? Sometimes your feeling connection with God may not be practically useful in your day to day life to solve many of your issues. At those moments, feeling connection with Guru will be handy and directly practically useful. At one point feeling connection with God and Guru will merge into each other. You will not have difference between two. You will just experience God and Guru is one and the same. That is ok. When that happens, it happens but now, please understand, when you begin your practices, when you begin your spiritual life, till you are enlightened, always have God and Guru both so that you are safe. I have seen people who had only God – never progressed. Who had only Guru – they sometimes dropped out. If you have both at least even if you have little shaking, even if your faith and trust, feeling connection towards a Master is shaken, your feeling connection towards God will keep you alive, will keep your spiritual path alive, will keep your spiritual enlightenment alive”. ‘God’, as per the Master is – “Each one of you has an intelligence to protect yourself. That intelligence to protect yourself which is there inside you is God. Even a small worm – if you try to kill, it will stand up to protect itself. So, the identity or the energy which is protecting itself constantly is God. It is there in every one of you, in all of us”.